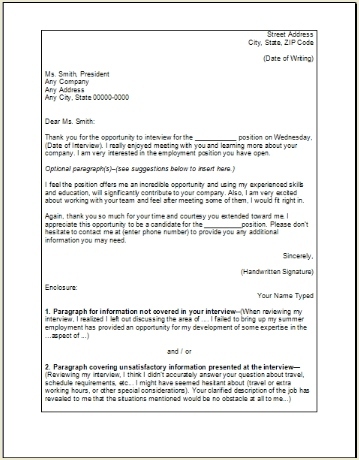 Using our sample interview thank you letter to write your own written correspondence that you take the time to create with any potential employer is by far the most effective thing you can do to help display your great communication skills to a new employer. You will need to definitely grasp onto this one time opportunity by mailing a thank you letter right after you have completed your interview and (very important) especially when the interview involved going to the company for a visit. Mailing a thank you letter directly to the person involved shows your courtesy. 1. This is your second chance to make an impression!! Grab on to this chance as soon as you can after your interview. Your thank you letter should be sent immediately while the interview is still fresh in your mind to show your appreciation for the interviewer who spent their time with you. 2. This would be a great opportunity to add some more information, which was not possibly covered in the interview, something you would feel the employer may need to know about you or possibly your qualifications for this position. 3. 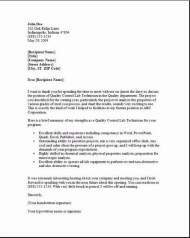 Use this letter as the perfect time to feed them more information that you feel might not have been shared during your interview. 4. If there was some additional information requested during the interview, make sure to take advantage and include it in the thank your letter. 1. Just copy and paste it into word and then start working on it!! I really appreciate the opportunity to interview for the ___________ position on Wednesday, (Date of Interview). Your meeting with me was very enjoyable and learning more about your company was very enlightening. I am definitely interested in the employment position you have open. I feel the position offers me a great opportunity and using my experienced education and my skills, will enhance my contribution to the company. Also, I am very excited about working with your team and feel after meeting some of them, I would fit right in. Again, thank you so much for your time and courtesy you extended toward me. I appreciate this opportunity to be a candidate for the __________ position. Please don’t hesitate to contact me at (enter phone number) to provide you any additional information you may need.